Greeting Card is individually handmade and decorated with my Award Winning Digital Art painting. Digital painting is an emerging artform in which traditional painting techniques such as watercolor, oils, impasto, pastels. are applied using digital tools. no magic "one click" computer program filter can give you such effects. The whole Original Art piece was painted with digital brush strokes ... one stroke at a time; building layer by layer or "cell-by-cell" to create depth and blending colors like with any art painting done with traditional media. 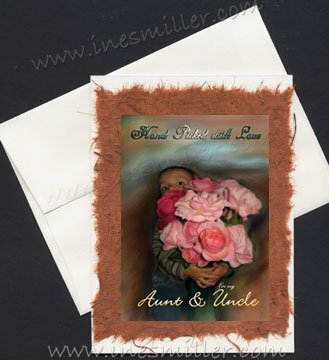 Little Boy hugging bouquet of Roses digital painting printed on an Archival high quality inkjet printer in Photo Paper mounted on quality off white linen texture card stock and off white color linen textured envelope. Two gift in one! A Unique One of a Kind Handmade greeting Card and a collectable archival print suitable for framing. Front of card reads: Hand Picked with Love - for my AUNT & UNCLE. Handmade greeting card Inside Message reads: Picking up with love the best flowers of my garden just for You. Happy Anniversary! Child hugging Pink Roses original digital painting print may be personalized with name or phrase of your choice; simply drop me a note at time of check out. *** Please e-mail me at: timelessmemories@aol.com with phrase or name of your choice. Card can be use as Earth Day Celebration Ecological Environment Awareness, Birthday Card day, Dessert theme cards, invitations, get well cards, love or friendship notes.